India is a place, well-known for its unity in diversity. It is a country where people belong to multiple cultural groups and celebrates the idea of being “unique in their own ways of performing rituals or customs”. Indian marriages are anyway pretty awesome and we cannot really describe each and every ritual and wedding ceremony in words. However, we can take a look at the most exciting and traditional wedding ceremonies which are considered as sacred and somehow necessary according to Indian families. Big-fat Indian weddings are being talked about in each and every part of the world. So, what are we waiting for? 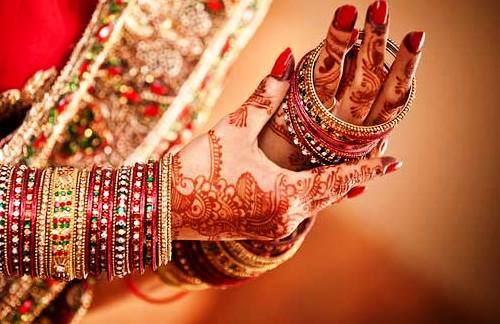 Let us begin and explore the most popular types of Indian marriages which reflect rich culture of different states of the country. Punjabis are known for their full of live attitude and their weddings are always full of enthusiasm and fervor. Punjabi weddings are all about loud music, entertainment, glamour, mouth-watering food and of course sweets, dance performances, exciting family functions and simply what not. 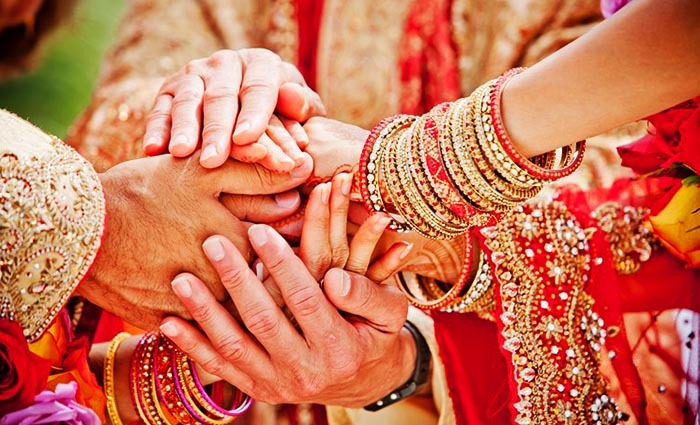 The pre-wedding rituals such as Roka (Pre-engagement), Sagan (engagement or ring-exchange ceremony), Sangeet (musical function), and Mehandi (Henna ceremony) are of great importance for family members as the wedding couple commits to enter into an infinite bond of love and togetherness. ‘Ardaas’ (prayer) is said to bless the couple and the exciting journey of pre-marriage rituals to post-marriage rituals begins. 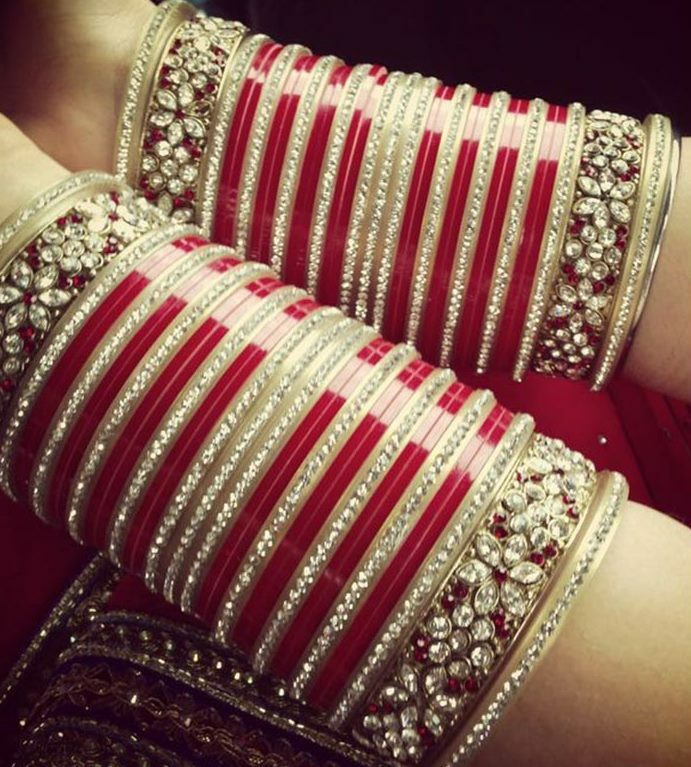 On the day of marriage, bride is gifted one of the most beautiful things known as ‘Choora’ (set of red-white bangles) by her Mama (Mother’s brother) that makes her look even more stunning on her most special and awaited day of her life. Eventually, remaining rites and rituals are performed at both bride’s and groom’s place and finally the wedding couple exchange garlands and tie a knot as they are taken to the Mandap to perform rituals. This is how Punjabi weddings make us fall in love with the way marriage is held and celebration is done. Sikh weddings are quite similar to Punjabi weddings. However, what makes the two different from each other is that a Sikh wedding takes place in Gurudwara, where the Ardaas or prayers are recited, known as Anand Karaj ceremony. The Anand Karaj ceremony can be performed during the day in any Gurdwara or home where Sri Guru Granth Sahib has been respectfully installed. 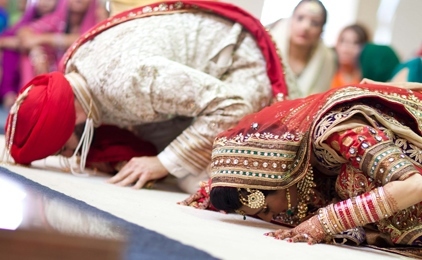 If both the bride and groom profess the Sikh faith and no other faith, then only they are allowed to tie wedding knots by the Anand Karaj ceremony. The Rehat Maryada followed in Sikh weddings strictly forbids any kind of dowry arrangement. Sikhs are also discouraged from consulting horoscopes or following any other superstitions in terms of determining auspicious date or time for wedding ceremonies. Bengal is famous for its rich tradition and of course, the ‘Bengali beauties’. The highlight of Bengali weddings is ‘Saat-Paak’, wherein bride has to encircle the groom seven times while covering her face with the betel leaves. The wedding couple is not allowed to stare into each other’s eyes until Shubhodrishti, another ritual is followed after the Saat Paak in which the bride removes the leaves from her face. This is the most beautiful part of Bengali Weddings. The bride’s family gifts the groom with the wedding attire, which includes a ‘jore’ (silk shawl), ‘dhoti’ and ‘topor’, a headdress made of pith and zari and it is always ensured that the groom must wear these items while the wedding rituals are being performed. Apart from different rituals and ceremonies like Gaye Holud (Turmeric ceremony), tempting Bengali treats including sweet rasgullas and ‘misti-doi’ (yogurt) make you enjoy the Bengali version of weddings at its best. Maharashtraian weddings are known for its simplicity while being a unique combination of various rituals and traditions that creates wonderful memories for each and every person who gets an opportunity to become an eminent part of such weddings. Sakhar Puda (Sugar Puja or Sweet Ceremony) is the primary pre-wedding ceremony and is the engagement ceremony for Maharashtrians. 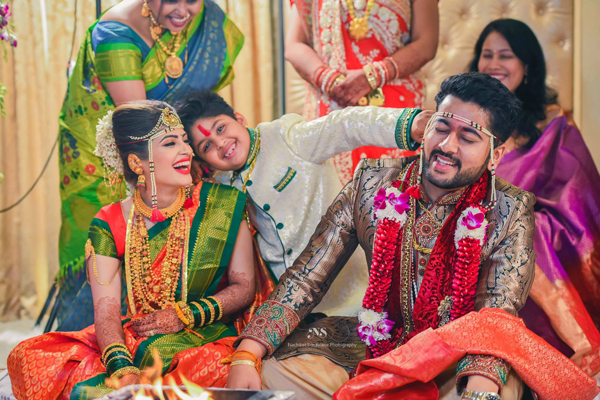 Like other Indian weddings, ceremonies like Haldi Chdavat (Turmeric ceremony), Mehandi (Henna), and engagement rituals, among others are performed with a lot of cheers and excitement. On the wedding day, the marriage ceremony comes to an end with Saptapadhi ritual, wherein the couple takes seven rounds around the sacred fire, while taking seven vows which is finally followed by Karmasampati ritual, wherein the bride’s father, the bride and the groom pray to God to bless the wedding couple for a happy and bright future. Rajasthani weddings are very traditional and full of colors and reflect rich Marwari culture. 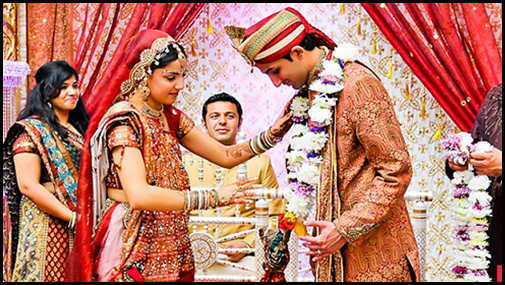 Rajasthani weddings are also known as Rajput or Marwari weddings. These weddings are quite similar to other Indian weddings, and entertain family members with different pre-wedding ceremonies. Sagan (Engagement ceremony) is a mandatory ritual for Marwari weddings which is followed by Pithi Dastoor or Turmeric ceremony and Mehandi (Henna) ceremony. Family members sing traditional songs, dance and celebrate in their own unique ways with tempting sweets and savory traditional dishes. Bhaat Dastoor is another ceremony, wherein the respective maternal uncle (“Mama”) of both the bride and the groom are invited to the groom’s and bride’s house for a traditional meal. In return, the maternal uncle gives gifts, clothes and money to his niece and nephew- which are considered as a token of their love of blessings. On the wedding day, garlands are exchanged by the wedding couple and a cloth knot is tied around the groom’s waist and its other end is tied to the bride’s dupatta. As the wedding couple completes the Phera (round) ceremony around the sacred holy fire, they get bonded with each other forever. 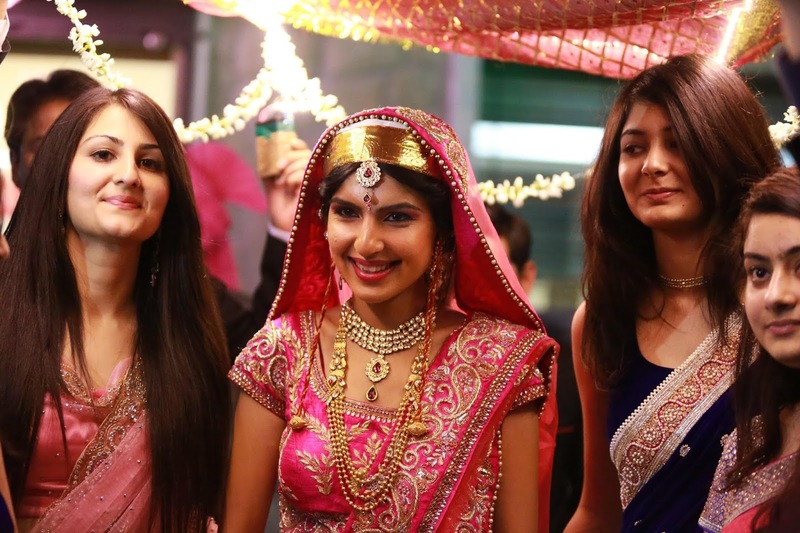 Gujarati weddings are colorful, and full of entertainment. With lots of sweets and mouth-watering Gujarati delicacies, pre-wedding ceremonies including Engagement ceremony, Turmeric and Henna ceremony, among others always remain incomplete without traditional dance- ‘Garba’ which is performed using hands and sticks hitting on each other. 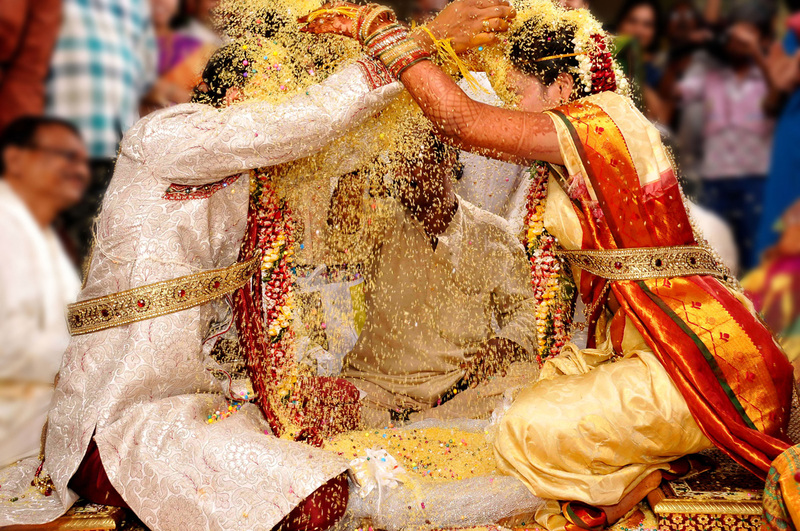 Unlike other Indian weddings, in traditional Gujarati weddings, the wedding affair begins with exchanging garlands twice by the wedding couple and the couple eventually take four rounds known as feras around the hawan (sacred fire) which signifies ‘Dharma’, ‘Artha’, ‘Kama’ and ‘Moksha’. Kashmiri weddings have a unique touch of traditional customs and rituals that reflects well in their wedding ceremonies. The engagement ceremony of wedding couple is known as ‘Vanna’, and the musical function is known as ‘Wanwun’, followed by other pre-wedding ceremonies. One of the most unique feature about Kashmiri wedding is that prior to a few days before wedding, the bride’s family sends 51 thaals (plates) to the groom’s home, which usually contains sweets, dry fruits, desi ghee, sugar and Gota. Also, the groom’s family sends flowers, jewelry and tinsel for the bride, as her first adornment. On the wedding day, the fathers of the wedding couple exchange ‘nutmeg’ that symbolizes eternal friendship. The remaining wedding ceremony is similar to that of other Hindu weddings and is followed by taking seven rounds around the holy fire. One of the most important pre-wedding ceremonies of Kannada wedding is Nandi, which is performed to ensure that the marriage takes place without any trouble/ hitches. There is a puja or worship that takes place with the use of coconut, aarti and a kalash (copper pot). The first invitation card is always offered to God. On the day of the marriage, a havan is performed in the respective houses of the bride and the groom which purifies the place. In a traditional Kannada marriage ceremony, the bride wears Navari sari and green glass bangles along with traditional gold jewelry which adorns her appearance. The groom wears a dhoti (vesti), Angavastram (white piece of cloth or stole) and a pheta (turban). In his right hand, the groom holds a stick which has been sanctified in a holy place. On the wedding day, many playful ceremonies take place which are followed by Dhare Herdu or the Giving Away of the Bride, wherein the bride’s father gives away the bride to the groom. He takes the groom’s hand and places it on the bride’s hand. This nostalgic moment when the bride is traditionally “handed” over to the groom, her father ceremonially pours water into the groom’s hands (known as dhara), signifying that she is now his. Corn/rice is then put into the havan or sacred fire five times, and finally the couple takes seven rounds called ‘Saptapadi’. 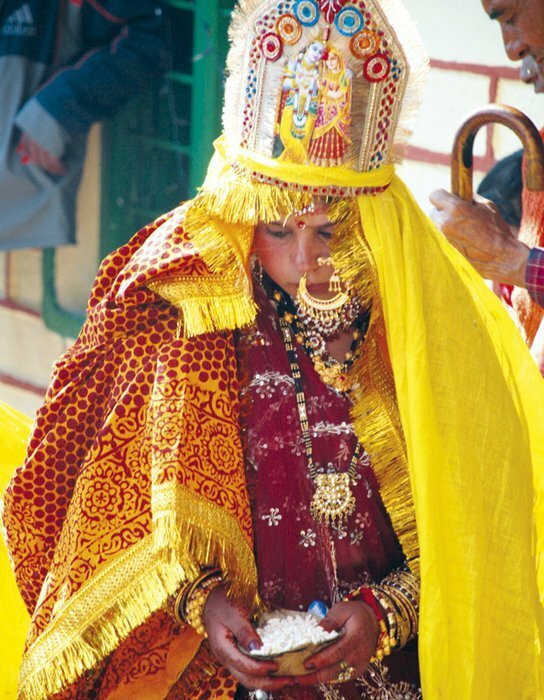 In Pahari or Himalayan weddings, bride is gifted the beautiful traditional Tehri Nath also known as Nathuli (nose-ring), either by the bride’s parents or the groom’s mother. During the Mehandi or Henna Ceremony, women sing traditional songs and dance on the same while showering their blessings on the wedding couple. When it comes to wedding attire, the bride wears a Ghaghra-Pichora (a tradional wedding attire) with some gold and silver jewelry and the groom adorns a dhoti-kurta, sherwani or a formal suit. The couple exchange garlands and other rituals are performed as the couple take circles around the sacred fire and commits to be with each other for the rest of the life. Pahari weddings are simple yet rich in culture. Assamese wedding follows a bathing custom on the day of wedding, wherein the bride and groom’s mother visit the nearby river to fetch holy water for the bath. 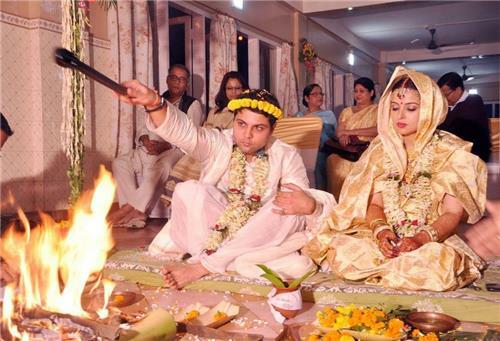 The most interesting and unique feature about Assamese wedding is the reception part, which is held prior to the wedding ceremony. In traditional Assamese weddings, curd, rice, and jaggery are served to the guests but at present, a grand reception party is hosted in which delicious dishes are served to family members and guests. On the day of wedding, the bride’s brother lifts the groom and takes him to the wedding hall and the bride is also gently carried to the wedding hall by her brother or maternal uncle. The traditional rituals are performed in front of the holy fire, where all the family members and close ones gather and sing Jura Naam (traditional Assamese wedding song). This is how Assamese marriages are a beautiful affair. Indian marriages always left us with wonderful memories that last forever. These are a unique blend of happy and nostalgic moments as the bride brings happiness to the groom’s home while leaving her parental home where she was born and brought up. All she deserves is due love and respect not only from her soul mate but also from her in-laws and new family members. Let’s celebrate the special bond of love and marriages.